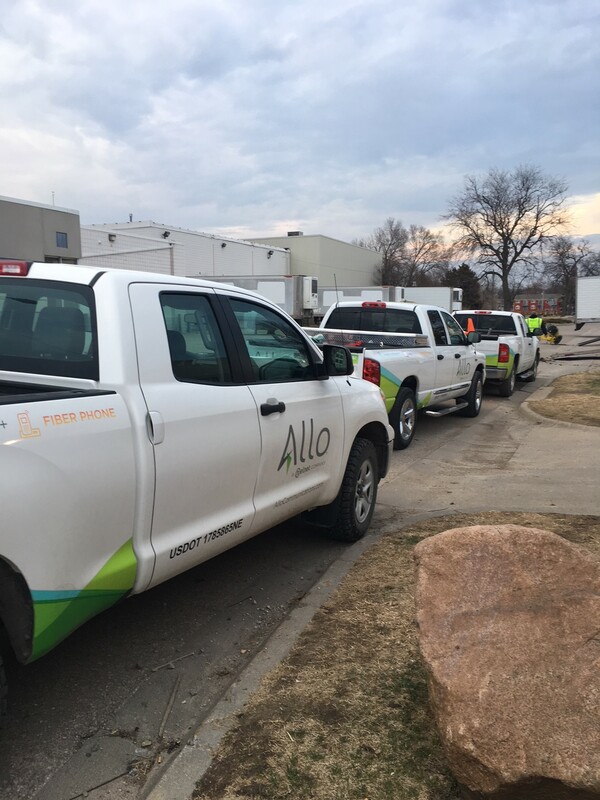 Recently, social media specialist Dalena went on a ride-along with the ALLO Drop Team to get a better understanding of the temporary line we place during the winter months. 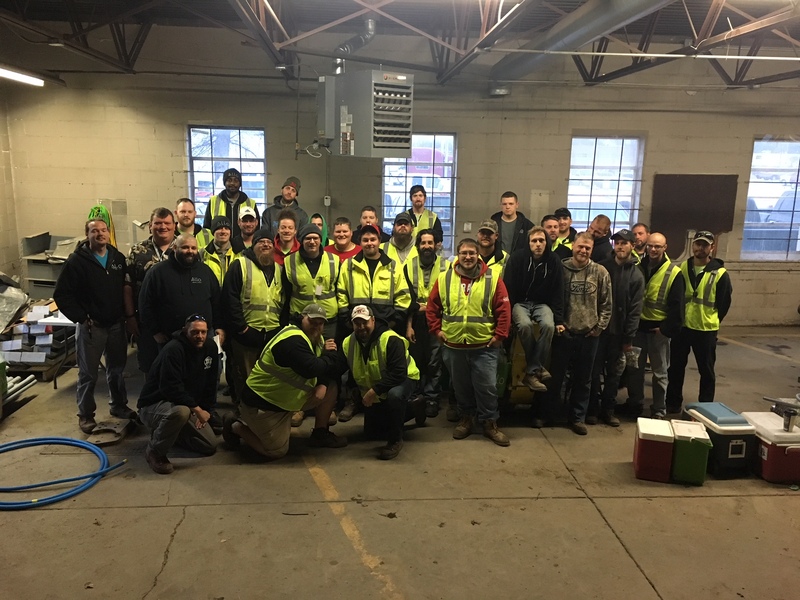 A few short weeks ago, she got the full experience, helping the team lay a temporary fiber-optic line across a snow-laden yard. You can read all about it here. In true Mid-West fashion, the weather has been as up and down as the Nebraska coaching line up but spring is here, and we’re pretty pumped about the Frost potential. Dalena barely returned from her ride-along before we were asking to join the Drop Team again. 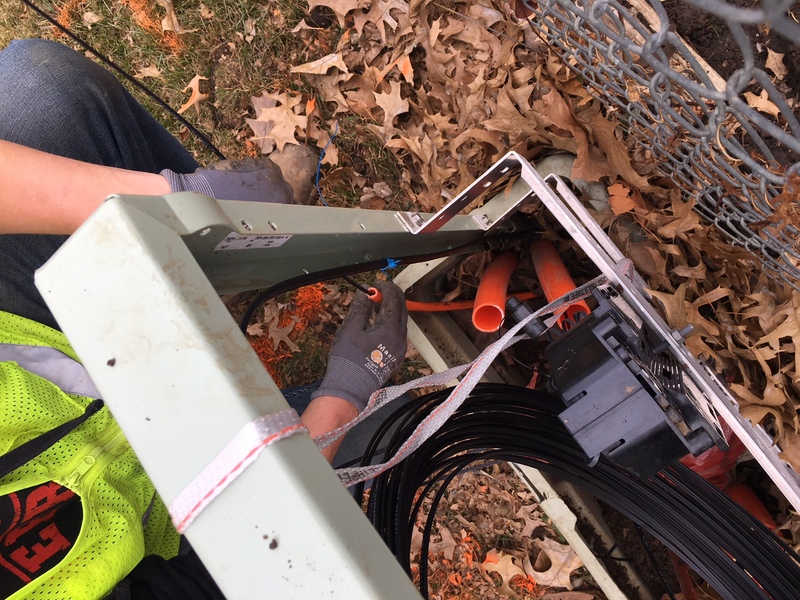 This time we sent Alyssa out to see how our team buries the fiber-optic line when the weather warms up. Before the ALLO team arrives to bury the fiber, we send two emails to let our customers know that we’ll be returning. Shortly after the email notifications, a phone call is made to explain that yard flags and markings will soon appear to show the location of existing utilities. When we arrive to bury the line, we knock to explain the process and leave a complimentary bag of lawn seed as well as contact information if any questions or concerns arise. If no one’s home, we leave the information at your door. For the first burial of the day, the pedestal was located just behind the customer’s fence. We dug a small path under the fence to run the conduit into the yard using the vibratory plow. This plow is the same type of machine used for installing sprinkler lines. Similar to a sewing machine, the plow places small stitches (8-12 inches) in the ground. 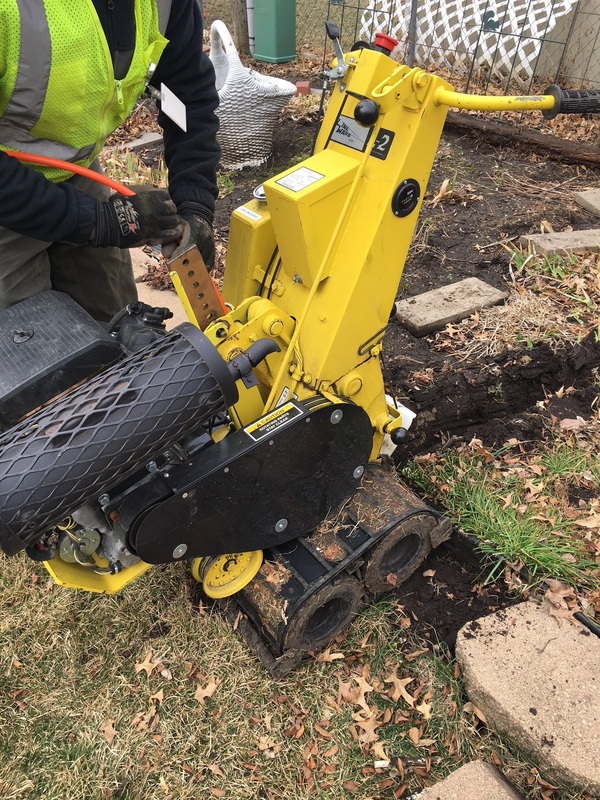 In some cases, we’ll use a different piece of machinery to navigate around concrete or stone. Next, we cut a small opening into the ground, and the machine pulls the conduit into this space. This microduct conduit is about the size of your finger. We then run the machine track back over this opening to ensure the grass and dirt are level with the rest of the yard. Next, we place seed above the small lawn scar, and as long as the area receives regular watering, this yard disruption is nearly invisible. At this point, our team disconnects the temporary fiber-optic line from the service box. 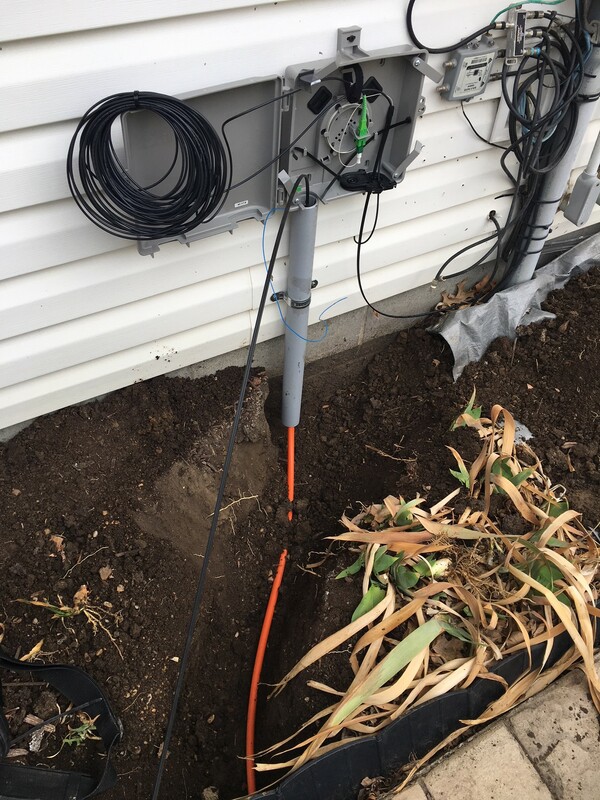 This takes ALLO service down for about five minutes while we splice the newly buried line, test the connection, and make the new permanent fiber-optic line live. Alyssa watched the clock and noted the whole process took about 30 minutes. The team explained that every burial is different though and depends a great deal on the yard and how far away the pedestal is from the customer’s home. Sometimes a pedestal is located 3-4 houses away. 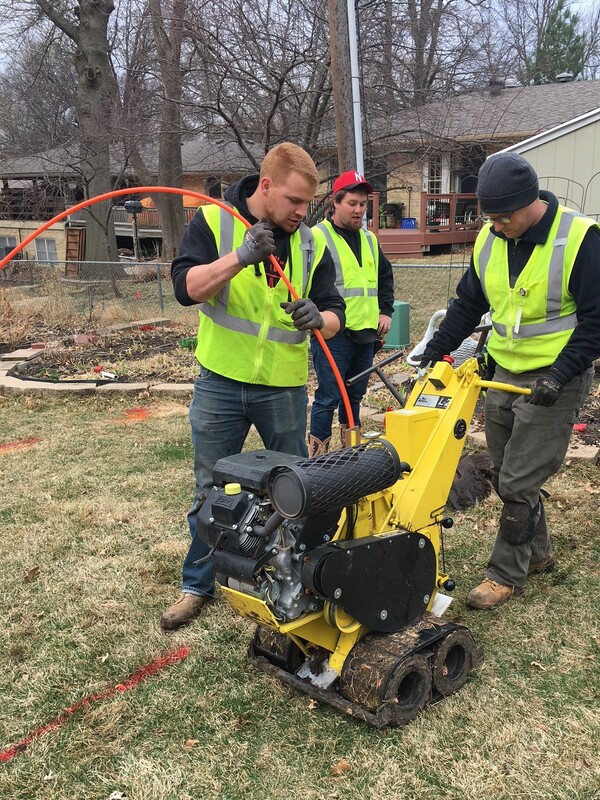 As long as the ground isn’t wet or frozen, our drop team will be out burying fiber-optic lines. The most common interruption to their progress is weather. It’s difficult to splice the fiber when it’s too cold. And if it’s too wet, we avoid digging up yards to keep lawns and gardens in the best possible condition. Additionally, a locked gate can throw the process off by several days or weeks. So if you’ve received the email and phone notifications, it may be a good idea to unlock your gate or try to be home during the burial if possible. 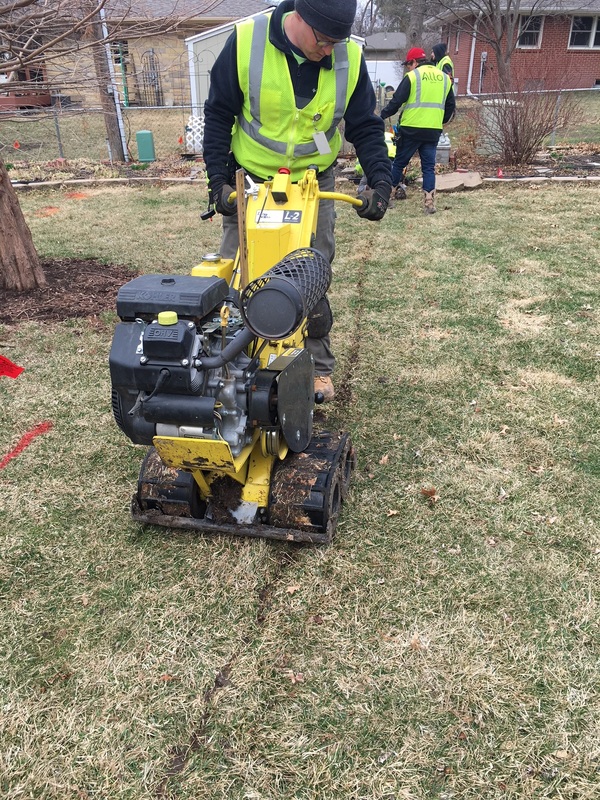 We know our customers take a great deal of pride in their homes and yards, so we do our best to be minimally invasive. If we can run the fiber-optic line along a fence, we will. 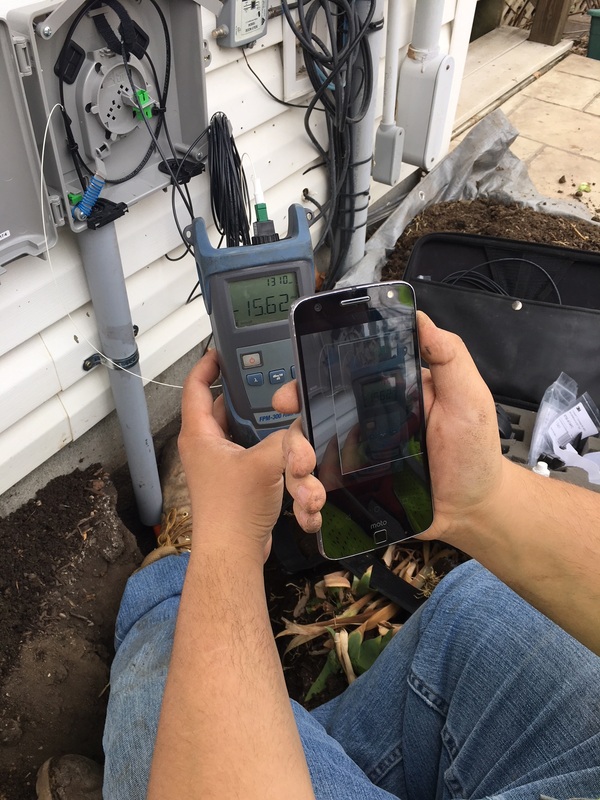 When we place the fiber interface box on your home, our first choice is near the electric meter, if that’s not possible, we place it close to the AC unit, and as a last resort, we’ll install it near existing utilities. If you have any questions or concerns about this process, our local team is happy to help. You can call us at 866-481-2556 or visit www.allofiber.com/construction to get in touch with our construction team.